With high resolution, Blu-ray is ruling the Home Entertainment. You might have paid a good amount of money for your Blu-ray collections and they can get be quite bulky. Now, you may just consider converting Blu-ray to MOV then transfer to iTunes so that you can watch the Blu-ray movies via iTunes on your iPhone SE, iPad Air 3, iPad Pro 9.7/12.9, Apple TV 4. But unfortunately, Apple does not create software to allow you to copy Blu-ray into iTunes directly. MOV is a file extension developed by Apple, it normally represents QuickTime multimedia file, often used in websites and in a lot of digital cameras, compatible with both Mac and Windows OS.To rip Blu-ray to MOV for iTunes playback on PC/Mac, you need a third-party software – Blu-ray Ripper to help you remove encryption of Blu-ray and shift format to MOV for iTunes. Here the guide just show you the specified tutorial on convert Blu-ray to MOV for iTunes syncing to any iOS devices on PC/Mac. As for Blu-ray Ripper, if you don’t any idea, I suggest you Pavtube ByteCopy for Mac and Pavtube ByteCopy for Windows <review>. This is a top-ranked Blu-ray to iTunes converter. You can see it in many top Blu-ray Ripper reviews online and recommendations for it on many forums. 1:1 backup Blu-ray/DVD with original video structure on PC/Mac. 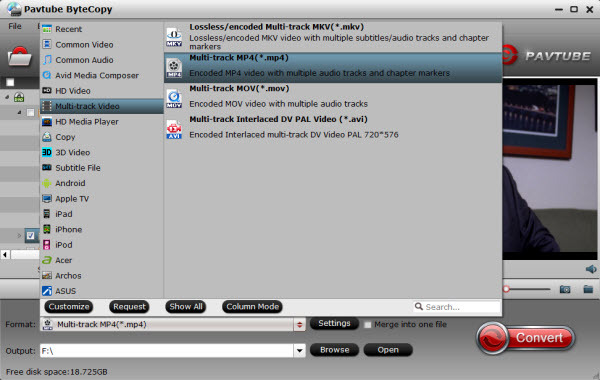 Copy Blu-ray/DVD to lossless MKV with multiple subtitle/audio streaming and all chapter markers and multitrack MP4/MOV on /PC/Mac. Note: The snapshots are from Windows version but the Blu-ray to MOV for iTunes convresion steps are suitable for both Windows version and Mac version. Typical ripping time may be around a few minutes, but will vary depending on your hardware of computer, output parameters you set, and size of the disc. After the Blu-ray to MOV for iTunes conversion, you can sync the ripped Blu-ray movies to iTunes on PC/Mac.